Get every webinar message on MP3 each week as soon as it’s released. All you have to do is subscribe to Malcolm’s podcast. To get the podcast, download itunes from itunes.com and install it on your computer. When you open itunes, browse to the ‘itunes store’ and click on podcasts. 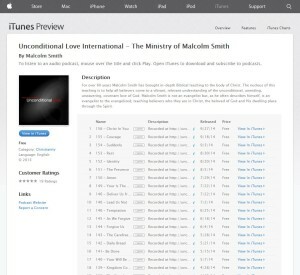 Search for ‘Malcolm Smith’ and you’ll find the Unconditional Love podcast. Click the ‘subscribe‘ button, and you’ll get the latest webinar MP3 every week – waiting in your itunes library. You can also download previous webinars and save them to your computer. Once you’ve saved the file, you can listen to the webinars any time without an internet connection. For a list of currently available MP3′s: click here.